Floodwaters Hit Record Highs In River North Of Chicago : The Two-Way The flooding north of Chicago has affected some 6,800 buildings and is "unprecedented," Illinois officials said. It's expected to worsen this weekend. It's been more than 30 years since the Des Plaines River hit the flood stages that it reached Friday, setting records with flood stages from 12 to more than 16 feet in several cities in northeastern Illinois — far above the flood stage of 7 feet that's normal for most of the area. The flooding north of Chicago has affected some 6,800 buildings and is "unprecedented," Illinois officials said Friday, as member station WBEZ reports. In many places close to the city, things are only expected to get worse. The National Weather Service's Chicago office has issued a flood warning that lasts until July 20, focusing on the Des Plaines River. It also issued an advisory for the Chicago River. Gov. Bruce Rauner declared a disaster in several counties Friday, after touring the damage in Gurnee, Ill., and surrounding areas. 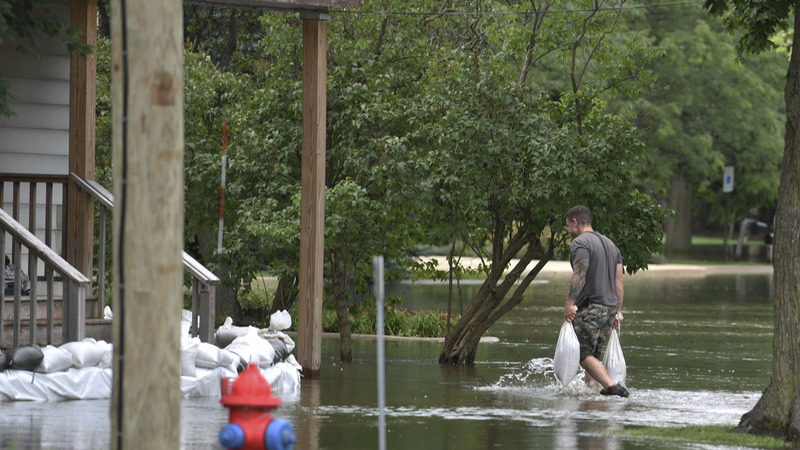 Flash flooding has also been reported in southeastern Wisconsin, where the Fox River reached record crests in recent days that resulted in reports of floodwaters that were 2-3 feet in people's backyards in Waukesha, Wis., according to the federal weather agency. The water is slowly moving through the rivers after intense rainstorms drenched the region on July 12. Some areas saw at least 7 inches of rain that morning — and it followed previous rains, the National Weather Service says. "With summertime moisture at its maximum, the storms produced copious rainfall rates," the service says. Both the Des Plaines and Fox rivers could crest on Saturday, WBEZ reports.